Whitefield Rising, a voluntary, non profit organisation focussing on transforming Whitefield, is making efforts to better the lives of the residents of Whitefield. As part of the effort, Sangeeta Venkatesh, one of the leaders from Whitefield Rising, along with her team, has forged an agreement with BBMP with the corporator’s support, to create a ‘Model Street’ in Whitefield, that can be free of garbage within three months, starting July. A 4-km stretch between Hope Farm and Varthur Kodi on Whitefield Main Road is being cleaned up to showcase as a model street. The road, which consists of many shops, has been split into 4 blocks of 1 km each. A detailed plan has been put in action to make the road clean and garbage-free by September 15, 2013 and become a role model for the other streets of Whitefield. A set of volunteers living in the area are taking time off to work with BBMP to monitor sweepers and contractors. The volunteers inform the BBMP contractor when garbage is not cleared and educating the shops about putting out their garbage. This will be achieved through an SMS system, preferably with photo. For each stretch BBMP has promised 4 sweepers instead of one. Dustbins on the pavements will be provided by BBMP. It is also procuring dustbins with wheels for sweepers to collect trash on pavements and roads and wheel it into the truck. A training programme for cleaners is also being implemented. Cleaners will also be given long brooms which are more efficient than brooms being used now. Other initiatives include getting plants to green some spaces, removing filthy spots, putting posters in shops that pread awareness on the need to stop using plastic bags and using dust bins. Shopkeepers have begun to notice a visible difference around the areas. However, there are still problems of rubbish reappearing at the same spot, especially in broken areas of the pavement, road etc. The Waste management group of the Whitefield Rising initiative has been furiously paddling in the back-end. However, to execute this efficiently, the Waste Management Team is looking for volunteers who can help them achieve this goal. One can write to whitefieldrising@yahoo.com expressing interest to become a volunteer. Grow vegetables, then ‘Eat Your Street’! Eat Your Street is an urban gardening initiative launched in Whitefield, with the aim of encouraging resources and communities to grow food in neglected public spaces and transforming them to thriving, edible gardens. For starters, the project will grow vegetables in 10 street areas of Whitefield. The plan is to plant a mixture of some traditional soppu, mustard, sunflower, corn, local flowers/herbs and a few vegetables. Right here in the urban squalor will be a place where the community grows fruits and flowers and veggies, works together and enjoys the foods of our labour. The campaign was flagged off on 14 July, 2013 with a community garden at Ramagondanahalli Government School, Whitefield, which will eventually be maintained and consumed by the children. The advantages of growing local food are aplenty. It provides easy access to fresh, nutritious, local food, keeps the resources in house, removes our dependence on food sources with unknown production systems. Supply to urban food markets, street food and food processing, providing additional employment and income generation potential. Water harvesting and urban wastes recycling provide water and compost to sustain requirements of urban agriculture. Integration of urban agriculture with urban greening programmes can reduce pollution and temperatures, as well as offer opportunities to improve quality of life for all urban residents. Gardening is a way to exercise and stay fit, and a stress buster. By eating your own food, you stop contributing to fossil fuel pollution. You’re eliminating your share of chemicals sprayed on food, your share of plastics and you give back and replenish the earth. To volunteer with this team, write to Rajani Mani at eatyourstreet@gmail.com. Weavers who have been selling bamboo products on the footpaths of Bangalore Gayanasamaja, KR Road for the past 28 years will now have to find another place to continue their business. Mahadevapura zone has 17 wards. 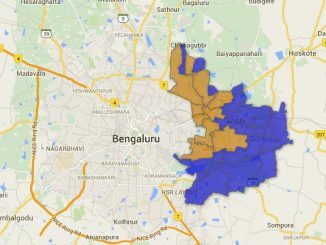 BJP dominated the BBMP elections – 2010 in this zone, by capturing nine wards. Here is the information related to the zone. to sell their produce at throwaway prices and then charge high prices to retailers.